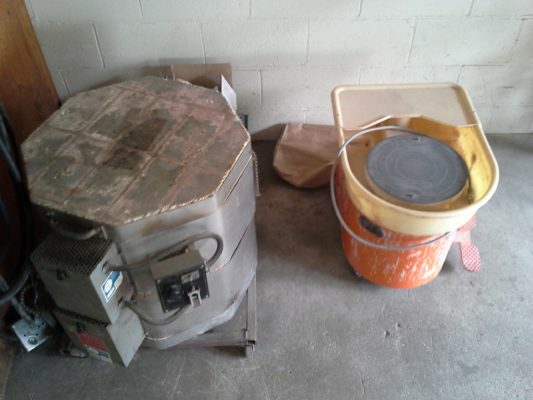 New Pottery Equipment! Soon, Classes! Thanks to a generous donor we now have a nice big potter’s wheel, currently residing in our garage by the Bike Bench. This pairs greatly with our kiln, which we’ve had for about a year now. With these two combined you can now start making pots, mugs, jars, and more at the makerspace! For those interested in learning we will soon have a class on working with clay and doing firings in our kiln. The potter’s wheel may require a one-on-one class, and will have to be scheduled by interest. If there’s a class you’d like to hear about when its scheduled, see our Class Waiting List page and fill out the form there.